"This is not science fiction!" announced the head of Byton, an electric vehicle startup, onstage earlier this week at the global technology conference in Las Vegas. CEO and Chairman Carsten Breitfeld was referring to the jaw-dropping, 48-inch (1.22 m) screen inside the Chinese-funded company's M-Byte car. Byton's vehicle will not be built until later this year. But its super-sized display - supplied by China's BOE Technology Group - is proving an undeniable trend in the automotive world, fueled by the rise of more connected cars. "The screens are the window to the digital world," said Gorden Wagener, chief design officer for Daimler AG, Mercedes-Benz's parent. "Screens are the new horsepower." It is not just futuristic electric and luxury vehicles that are upping the size ante. Fiat Chrysler's 2019 RAM 1500 truck boasts a 12-inch vertical display in its dashboard. Besides the center console, instrument clusters, which house driving controls, and rear-seat entertainment displays are both growing in size. 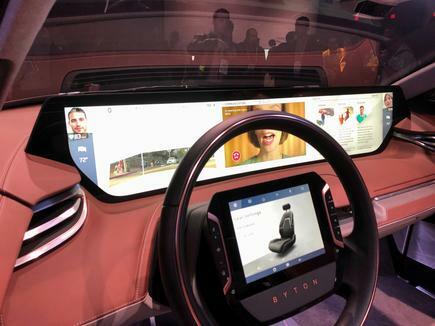 Automakers like Audi that combine the center console and instrument cluster often refer to a "cockpit," necessitating a wide, sweeping screen, like Byton's, and more consolidated computing power. Carmakers are adding a rear view mirror display to project images from a rear-facing camera, while "heads-up displays" - where projected images float on the windshield to impart valuable information to the driver - are an exploding market. "We're living in a display-centered world," said Brian Rhodes, Connected Car Research Lead at IHS Markit. "I don't think it's coincidental we have a lot of screens in vehicles that look just like tablets. That's clearly the trend." The average size globally of a vehicle's center display in 2018 was 7.7 inches, according to IHS Markit, and it is projected to grow to 8.4 inches by 2024. Tesla Inc was the first to wow drivers and send rival automakers scrambling when it came out in 2012 with a 17-inch LCD display for the Model S. Apple and Alphabet's Google subsequently introduced CarPlay and Android Auto, which allow streaming music, maps and other apps to be accessed through the car's center display. That, more than Tesla's influence, is the primary reason automakers have embraced larger screens, Rhodes said. But Apple and Google's debut inside the car's main display ushered in fraught soul-searching by automakers, who have been loath to cede such valuable real estate to tech rivals, yet anxious to give consumers the iPhone experience they crave. That tension is still playing out inside the car, where some automakers have been "passive-aggressive" about fully integrating Apple or Google for an optimal experience, said automotive research director at Gartner, Mike Ramsey. The result is an often clunky user experience. In some cases, Ramsey said, "They're supersizing the screen without any actual benefit." Although such problems originate from the back-end tech that drives the content and not the screens themselves, "from the consumer's view it's one and the same," Rhodes said. "If it's being led by the automaker to design the user interface it can be a big ask," said Rhodes. Until recently, he said, it "wasn't their core competency." Mercedes' MBUX user interface released last year at CES is seen within the industry as the one to beat. "Of course we want to own the real estate in our own car," newly appointed Daimler AG CEO Ola Kaellenius told a small group of journalists on Tuesday. "You need to own your own digital soul of your car." Key to that, however, was having an "open source mindset" so that Mercedes' ecosystem could integrate with others, he said, such as Google and Apple's. "You need a place to visually display that information to the driver in a way that is effective and not distracting. So you need real estate," said Abe Chen, vice president of Digital Technology at Byton. The optional 10-inch display on the 2020 Ford Explorer sport utility vehicle - and the standard 8-inch display - were designed to discourage drivers from getting immersed in too much data by stacking information, including CarPlay and Android Auto, Ruth Vann, Ford's user experience supervisor, told Reuters this month. "There are things we will lock out while driving," she said, adding that customers will be encouraged to use voice commands.